This post on gift giving is sponsored by Those Media Girls and pick UR gift. All words and opinions are my own. For me, gift giving is a lot of fun. I really enjoy going down my list, considering the likes and hobbies of each recipient, and then finding an item that’s really going to make them smile. It doesn’t even have to be the “perfect” gift – just something I know they’ll love or enjoy. When I shop, I have a tendency to do so in order of ease of gift selection. So by the time I get to the bottom of the list the gift giving process becomes a little less fun and a little more stressful. Fortunately I’ve just discovered a gift giving site that might just add the joy back. The site is called pick UR gift and it’s definitely unique! They’ve taken the traditional wish list process and added a really smart twist – the reverse wish list. With the reverse wish list you choose a variety of gift options, then forward that list to your hard-to-shop-for father-in-law or your sister that already owns everything, and they get to pick which gift they want. What I think is cool about this service is that unlike a registry you still get to include your own personal creativity and thought in the gift giving process. You also get the peace of mind knowing that the person receiving the gift is getting something that they love. It really is win-win. Creating a list is really easy. After registering on the site you add the bookmarklet tool to your toolbar. Depending on your browser, it’s as simple as dragging the UR Button icon to your toolbar. 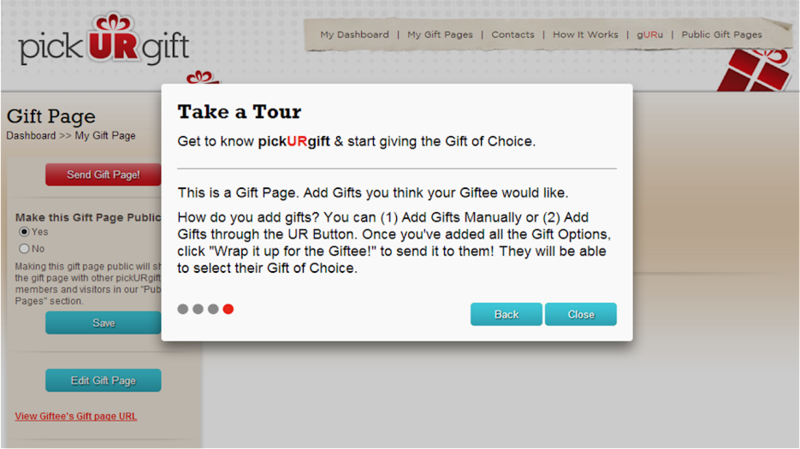 You can also add gift ideas manually, but I really love the convenience of the button. After the quick registration and adding the bookmarklet you’re ready to surf the web and start curating suggestions. I decided to start with a list for my Dad and headed over to Amazon, since they have pretty much everything. He spends a lot of time outside during the winter, especially when blowing snow, and it can get COLD in Northern Maine. 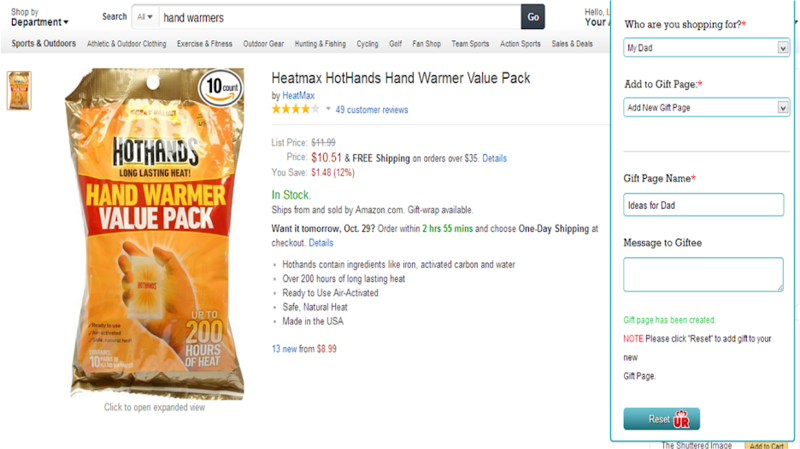 I thought he might like these hand warmers, so I clicked the UR Button and added them to my “Ideas for Dad” list. So once you create your list, what do you do with it? Well, you can send it over to the list’s namesake and have them choose their favorite item. Or you can send it to other family members who are trying to choose items for that person, too. And if you’ve made one for yourself, you can print it out and tape it to the bathroom mirror as a not-so-subtle hint. I totally see myself using this website for lots of occasions going forward – birthdays, holidays, graduation. If you can see yourself using it, too, you should head over to Eighty MPH Mom’s site. She’s giving away a $200 VISA gift card to help you take care of a few names on your wish lists! Whom do you think you would use pick UR gift to shop for? That’s an interesting idea! I could use that for my Dad, and both of my mother-in-laws and father-in-law. I think other grown-ups are the hardest to shop for!